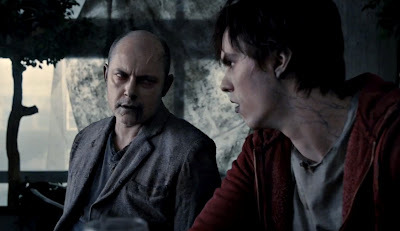 The strangely intuitive R is an outsider - the weird kid who doesn't act like a normal Zombie and strays away from the group and gets lost - but he imagines the former professions of his fellow Zombies and contemplates the daily hustle and bustle of the airport. A telling flashback from before the apocalypse features crowds of busy people existing miles apart from one another, their singular existence plugged into phones, iPads and other portable devices. Already, they were becoming tech-reliant undead, in need of revival. Though our endearing protagonist and his cohorts attack the survivors, and sloppy brain-guzzling ensues, we are in the strange position of having already been acquainted with a character who since the Romero days (Dawn of the Dead) have been facing the barrel of a shotgun. We are sympathetic of his sad existence and understand what is required of him to survive. The bond that blossoms between R and Julie isn't immediate, but with R making the effort to connect woth Julie, his kind intentions are received and reciprocated. This is a film that reveals that love can come from the unlikeliest of places, amidst war and chaos, and that kindness and loyalty to one another is essential. Hoult, whose wide-eyed stiffness and lanky Zombie-isms remain consistent throughout, subtly adds new human skills to his physicality. His expressive face, and suppressed torments about his self-esteem, really hit the mark here. Palmer is also fantastic and shares excellent chemistry with Hoult. Her emotions are compelling, whether she is frightened of R, confused by the bizarre situation she finds herself in, or desperate to turn around her father's prejudice. Key supporting roles from Rob Corddry (Hot Tub Time Machine) and Analeigh Tipton (Crazy Stupid Love) provide some strong laughs, especially Corddry and Hoult's bar 'conversation' and Tipton's proposed assistance with R's human makeover by accompanying it with Roy Orbison's 'Pretty Woman'. On that note, the soundtrack rocks, and it is hard not to be won over by R purely because of his record collection. There are a few inconsistencies, but these matter little because the film's premise isn't air-tight itself. There was a confusing blend of Zombies that could walk/run. The Bonies - not the best effects work I have seen, either - can sprint but in one flashback it seemed like newly turned Zombies have legs too. The story also gets stalled at times. The lengthy periods spent hiding out (the plane, an abandoned suburban home) limits the continual flow of the narrative, but serves to develop the film's key attribute, R and Julie's relationship. Also, as great as John Malkovich is, his snarly turn as an absent/over-protective father who shoots down anyone and everyone's advice was standout ham. 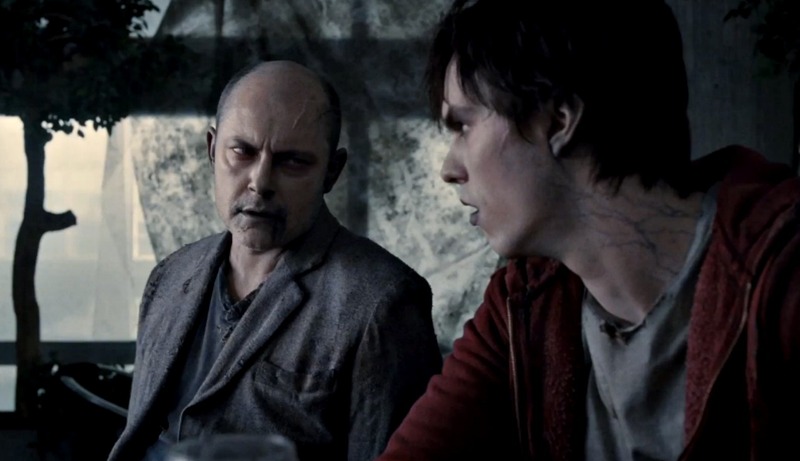 Warm Bodies is a fun, creepy and heartfelt Zombie flick, and a likable twist on the genre. Great central performances and a commendable message at the beating heart about humanity and the importance of making the effort to connect with one another will likely leave this a crowd favourite.